Safety signs are a great way to alert pedestrians. Keep your workplace safe and productive with these forklift safety accessories. A safe forklift driver is the best defense against on-the-job accidents. With proper training, common sense work practices, and sober judgment, a well-qualified forklift operator is a safety coordinator’s (and OSHA’s) best friend. Next up on the list is the forklift safety accessories. With OSHA inspections, bad publicity from mishaps, and large fines & penalties from accidents, forklift companies have been working furiously over the past few years to develop add-ons, attachments and other devices to make driving a forklift as safe as possible. Let’s take a look at some of the latest forklift safety accessories worth your consideration, whether you’re a supervisor or rookie forklift operator. Proper restraint is often overlooked in regards to safe forklift operation. 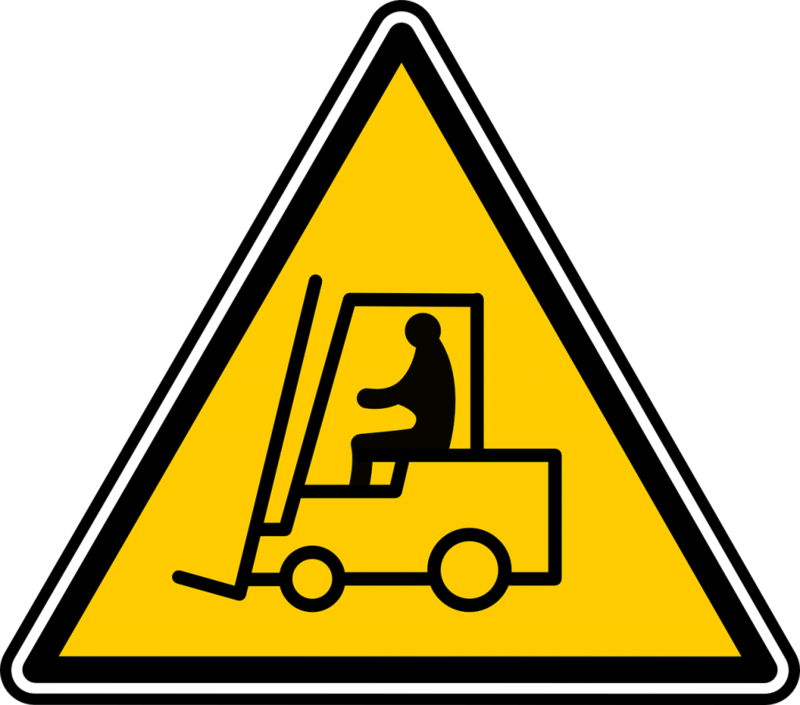 Many injuries are caused by sudden forklift movements, which can propel the driver out of the cabin. Fully adjustable, customizable belts are among the top forklift safety products for keeping operators safe and preventing them from catapulting out of the forklift cockpit. If your warehouse or work environment has regular foot traffic, it helps to alert pedestrians of forklift activity. Fully integrated warning systems notify anyone walking into a work area of nearby forklifts – essential forklift safety accessories for forklift drivers and pedestrians alike who work in noisy warehouses. This system from Driveway Alert helps prevent accidents. Need extra indicators among your forklift safety products? It’s hard to miss a high-powered, lighted sign. They’re perfect for entrance/exit areas, slow zone areas and other places that require extra caution. When on-foot workers are busy performing tasks within a loud work area, lighted signs are the visible aids they may need to stay safe and avoid forklift zones. Another type of sign that helps promote safety is a safety scoreboard. It reminds workers how long it’s been since the last workplace injury. Digital safety scoreboards are easy to update and is a visual reminder of how important warehouse safety is. In heavy industrial areas, keeping falling debris and other objects away from and out of the cabin is a big priority. ClearCap offers an excellent variety of easy to install forklift “roofs” that offer superior protection, and enable full visibility as well. Forklift cap covers are one of the best forklift safety accessories for preventing injuries on indoor and outdoor worksites. A clean workplace is a safe workplace. And with a forklift broom, you can keep your floor clear of dust, debris and other undesirable objects. Water, grease, and other liquids make warehouse floors slippery and serious hazards for forklifts. Use forklift safety accessories like mounted brooms to easily keep floors dry, quickly. The best thing about forklift mounted brooms is their efficiency; simply plan a route, mount the broom accordingly and let your driver take care of the rest! Placing mirrors on the walls of your warehouse and on the forklifts increases the visibility of your workers and gives them a wider range of sight to keep clear of pedestrians and stationary objects. Column guards are essential forklift safety products wherever forklifts are working. Column guards protect the columns in a warehouse, prevent structural damage, and provide a cushion to minimize the effect of a collision for operators. Bright, reflective paints and tape are great forklift safety products for warning forklift operators of “no drive zones” and “slow zones” in a warehouse. In addition to signs, paint, and other visual aids, reflective clothing makes pedestrians stand out to busy forklift drivers. As far as forklift safety accessories go, this is a just sampling of some of the most popular forklift safety products available. If your work area needs improvement anywhere, try a new safety product. The selection today dwarfs the assortment from just a few years ago. Along with these forklift safety products, the best plan to avoid accidents starts with a trained, professional forklift operator. The majority of forklift-related accidents are the result of operator error, which means it was unsafe practices that led to the mishap. Without training, forklift operators simply aren’t prepared for the risks at hand, and aren’t as able to avoid hazards. In addition to forklift safety accessories, forklift training along with three-year refresher training is the most effective way to prevent tip-overs, collisions, crushed-by accidents, and costly equipment damage. Luckily, CertifyMe.net offers the most complete, convenient, and cost-effective training on the market. Our program is completely online and can be accessed from any device with the internet. From home or at work on a lunch break, operators can move through the training modules at their own pace, and have their operator certification card in hand by the end of the day. Once they’ve passed all online quizzes and tests, all that’s needed is the in-person skills evaluation. That’s it! Your employees will be 100% OSHA-compliant and prepared to keep your workplace safe, along with the help from your forklift safety products. CertifyMe.net prides our self on creating the most affordable, comprehensive training courses available. We give employers the option to choose the individual forklift-specific training they need most, or save with the discounted bundle package that includes each type of forklift. Our courses are ideal for beginners, veterans and every skill level in between. Take control of what and how your employees learn and make your workplace safer! Are you ready to save money, get more efficient operators, and be 100% OSHA-compliant? Give our OSHA safety consultants a call at (888) 699-4800, or visit the CM contact page today! We can tell you everything you need to know to get your workplace certified and compliant, as well as how to use forklift safety accessories most efficiently in your workplace.